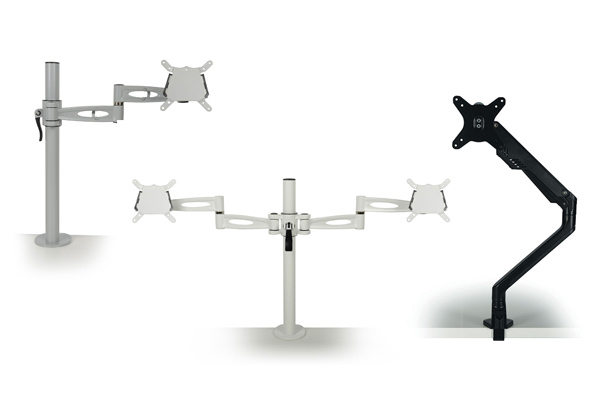 Ergotron WorkFit-Z mini compact desk riser. Transform your desk into a sit-stand workspace with easy height adjustment so that you can be active at work, move more and burn extra calories too! Simply place the WorkFit-Z on a surface, release the hand-brake levers on either side to position the surface at the required height and you’re ready to work. Desk risers offer an economical solution when looking for the flexibility to either sit or stand while working as well as being perfect for use with contract furniture that can’t be easily changed for a height adjustable desk. The Workfit T is a sturdy desktop converter offering a workstation that can be easily adjusted (it’s counterbalancing mechanism uses CF™ technology to facilitate quick height adjustment) with the stability to be lent on while working without worry of tip or height-drop. Also available in a slightly larger version – the WorkFit-TL and a smaller version too, the WorkFit-Z mini. Supplied fully assembled with no special mounting or tool-adjustments required for installation. No cranks or motors to engage, silent movement. Sits directly on top of desk – no special mounting or tool-adjustments required for installation. Standing desk converters, also known as desk risers and sit-stand platforms are designed to retrofit furniture for sit-stand height adjustment. Lead time: Normally a stock item, please allow 3-7 working days for delivery.